Liona originally from Ballyfermot, has now been living in Lucan for more than 20 years. As a child growing up she spent many summers in Lucan with extended family living in Arthur Griffith and Hillcrest Estates. Liona and her husband Ciaran have three school going children. Prior to being elected Liona was very active within her community, successfully leading various campaigns and driving community initiatives. Liona is an accounts technician and has used her experience over the years to support local companies starting up new business’s. She has worked in a number of business’s within Lucan and Palmerstown areas and currently works part time for a locally based company. Liona was a founding member of Finnstown Abbey Residents Association and was chair for over 5 years prior to her election to South Dublin County Council. Liona was also a founding member of the Finnstown Input Group in 2001 which campaigned for better planning of the Adamstown development. Liona was chair of St. Thomas’s School Parents Association for 3 years and is currently chair of Scoil Áine Naofa Primary School Parents Association. Liona has a keen interest in the promotion of Sport with herself and family being active members of Lucan Sarsfields GAA, Weston Hockey Club and Lucan Harriers. Liona was elected to South Dublin County Council as an Independent Councillor in May 2014. 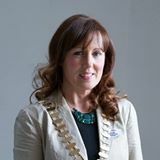 Liona was also elected Deputy Mayor for South Dublin County Councillor for 2014/2015 by her fellow councillors. This was a great achievement for Liona as it was her first time running in the local elections.